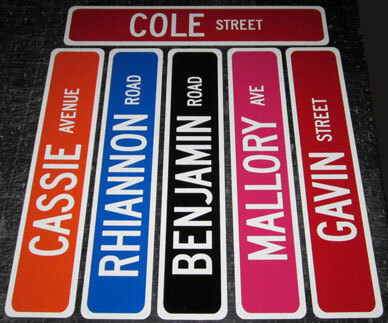 Custom personalized street signs that look exactly like our real street signs--just smaller. All our signs are made from .040 aluminum and come in several different colors and are one or two sided. These are the the perfect personalized gift for less than $12. We will put Anything you want on your signs. Our non-reflective mini street signs are available in green, black, brown, blue, red, orange, magenta and yellow and come with white letters and white borders. Sign brackets are not available for mini signs. All orders shipped within 4 business days of ordering (UPS $5.95 ground shipping if you are just ordering street sign minis). Additional shipping charges may apply on PO Box shipments Alaska, Hawaii and Canada. Sorry no overseas shipments available at this time. Depending on the sign ordered, letters will be 1.5" to 2"; all suffixes will be 0.75" to 1.25". Our staff will determine lettering layout unless specifed in Additional Information on order page.